Do you have any photographs of your Greek ancestor's living quarters when they first migrated to the United States, or any other country where they settled? I have seen plenty of dining room photos from the 1940s and 1950s, after they were established in their new country, but I'm referring to the late 1800's through 1920's. If you do, please share a copy on the Hellenic Genealogy Geek facebook group page, I am sure everyone of them will be appreciated by all. 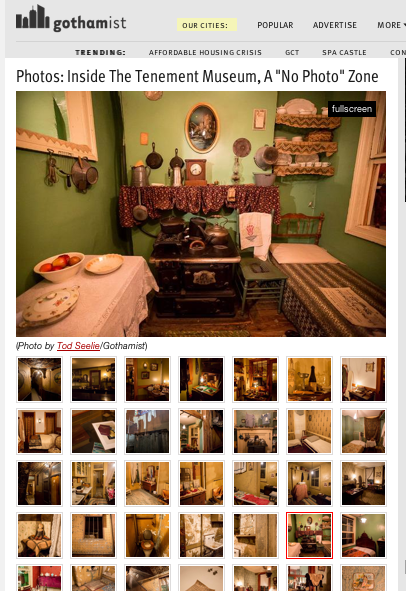 December 7, 2014 an online article was published by gothamist.com titled PHOTOS: INSIDE THE TENEMENT MUSEUM A "NO PHOTO" ZONE which features 42 photographs by Tod Seelie. "The Tenement Museum has a strict "no photo" policy, as they believe it takes away from the visitor experience - "We are trying to facilitate an interactive experience with our visitors. It really is what makes us unique," the Museum's Jon Pace told us. "All the tours we offer are led by an educator." That all changed last night, however. For one night only, the museum allowed cameras inside for their Snapshot event. During two separate sessions, participants were allowed free reign on each floor, and along the way could document the Museum's re-created homes and historic German beer saloon."